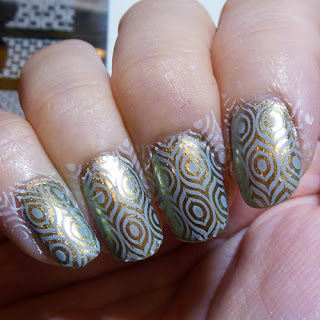 I was looking at one of the prints on an XL stamping plate and saw one design that I thought looked really interesting. 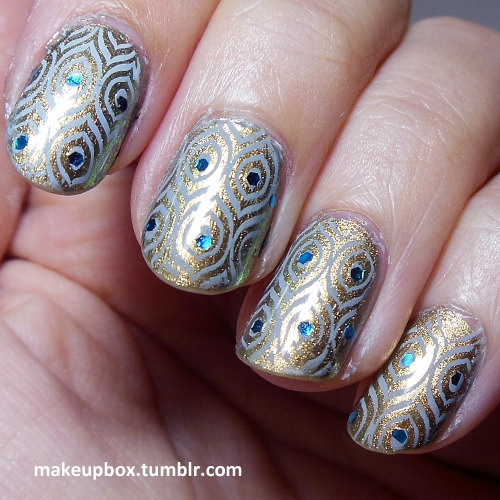 It's a geometric pattern that looked kinda organic (peacock) and kinda tribal/sci-fi in a rather 5th Element or WoW Iron Dwarf relic kinda way. Nerd, I know. 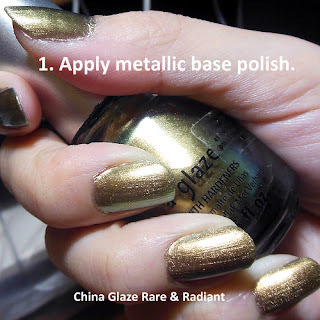 A beautiful duochrome polish olive-green from China Glaze that's a dupe for Chanel Peridot, called Rare & Radiant. 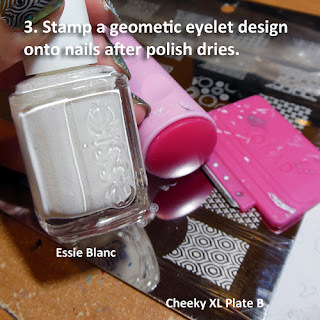 A white Essie polish as stamping color. I didn't use a Konad stamping polish as it was too stark and opaque a white and I wanted something softer. 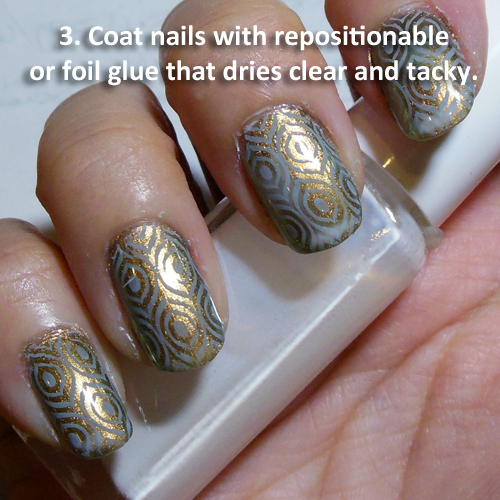 Make sure your nail polish is completely dry or you will smear it when you stamp. If you're using repositionable glue, let dry completely, or it will not be sticky and your glitter flecks will slide around. 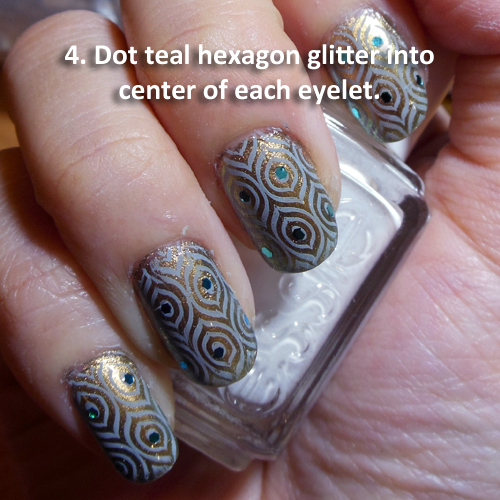 I used a fine dotting tool with a touch of glue on the tip so it would pick up glitter. You can use a toothpick or orange stick as well. I used Seche Vite topcoat because it is less likely to dissolve and smear the stamped pattern beneath. 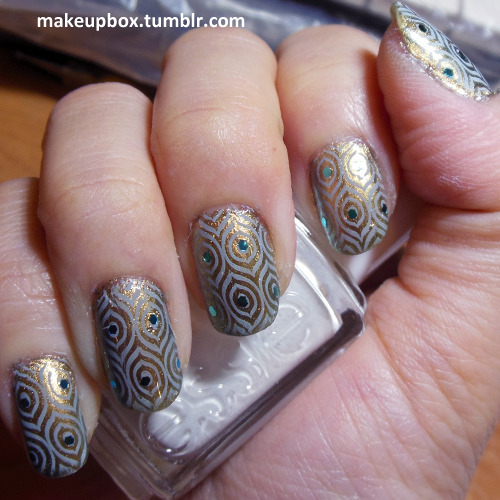 I really like this and WILL be trying it myself!